Vijay Rupani and Nitin Patel were on Sunday sworn in as the Chief Minister and Deputy Chief Minister of Gujarat respectively at Mahatma Mandi in Gujarat. Governor OP Kohli administered the oath of office and secrecy to Rupani and Patel. BJP chief Amit Shah, Senior BJP leader LK Advani, Union Finance Minister Arun Jaitley​, Maharashtra CM Devendra Fadnavis, Anandiben Patel attended the oath taking ceremony. 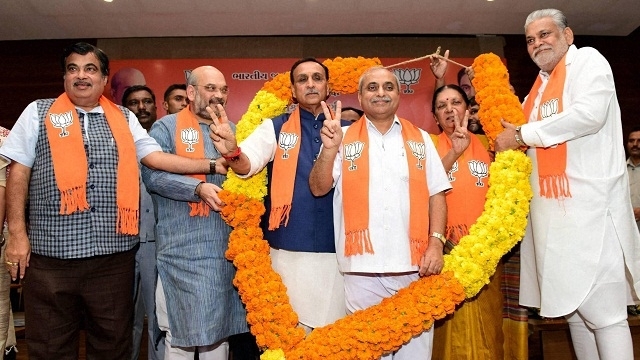 On Friday, in a dramatic turnaround the BJP central leadership decided on the name of Rupani to replace Anandiben as the chief minister of the state, instead of Nitin Patel who was front-runner for the post till the last moment. The Legislature party meeting was delayed by about two hours due to jostling between the groups of party President Amit Shah and incumbent Chief Minister Anandiben. Anandiben had insisted that her confidante Nitin Patel should be made the chief minister of the state, while Shah had firmly wanted his nominee Rupani to be on the top post. As a compromise formula, Rupani was made the Chief Minister, while Patel was declared as Deputy Chief Minister after intervention of central BJP leadership, including Prime Minister Narendra Modi.